Multi-purpose insecticide, fungicide and miticide. Controls insects, diseases and mites. Can be used up to day of harvest. Kills eggs, larval and adult Insects. Prevents fungal attack of plant tissues. Use indoors or out. 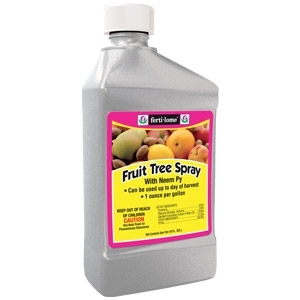 Can be used on fruits, nuts, vegetables, herbs, spices, roses, houseplants, flowers, shrubs and turfgrass. Controls Rust, Leaf Spot, Anthracnose, Powdery Mildew, Black Spot, Brown Spot, Dollar Spot, Needle Spot, Scab and Flower, Twig and Tip Blight.